I dreamt of owning a nice boat ever since I was 6 years old. At ten I started cutting lawns to pay for a subscription to Yachting Magazine. That said, I never actually thought that one day I’d be so blessed as to own a boat like Vigilant – our Back Cove 41. As a sailor, I learned about the iconic Maine built Hinckley’s at an early age and even chartered a wooden hull Pilot 35 out of Westport once – such a sweet boat that sailed effortlessly. When it came to handmade boats from Maine, Sabre Yachts was always the “new kid on the block” and their original 38′ Express was one of my dream boats for many years. About 15 years ago, they bought their composite supplier and started Back Cove Yachts as a less glamorous, single diesel line. The first Back Cove that I ever seriously considered owning was the 30. I was at the Newport Boat Show and it had just been launched. I had always owned center consoles, but the layout really caught my eye. It was a perfect day boat that would also be a nice overnighter for a couple. When we got serious about buying a new boat in 2014, Joyce at BYS connected me with Back Cove’s National Sales Manager Lindsey Braun who was not only helpful, but also very accessible via phone or email. Lindsey sent me photos of both builds for every step of the way. After Vigilant was delivered, she also sent me a beautiful book of all the production photos. I have also met Bentley Collins and worked with Jason and Guy on service issues. Although Sabre and Back Cove are fairly large companies, everyone is helpful and easy to reach when needed. I’m sure there are great boats built everywhere, but for some reason, folks along the Maine coast seem to make some of the best. If Sabre and Back Cove were automobiles, Sabre might be Lexus and Back Cove would be Toyota. As with these great car lines, quality begins with a great design, top quality components, and handmade craftsmanship. I wasn’t watching the calendar when they built Tenacity, but I do know that the first picture Lindsey sent me of Vigilant being built was in August of 2016. 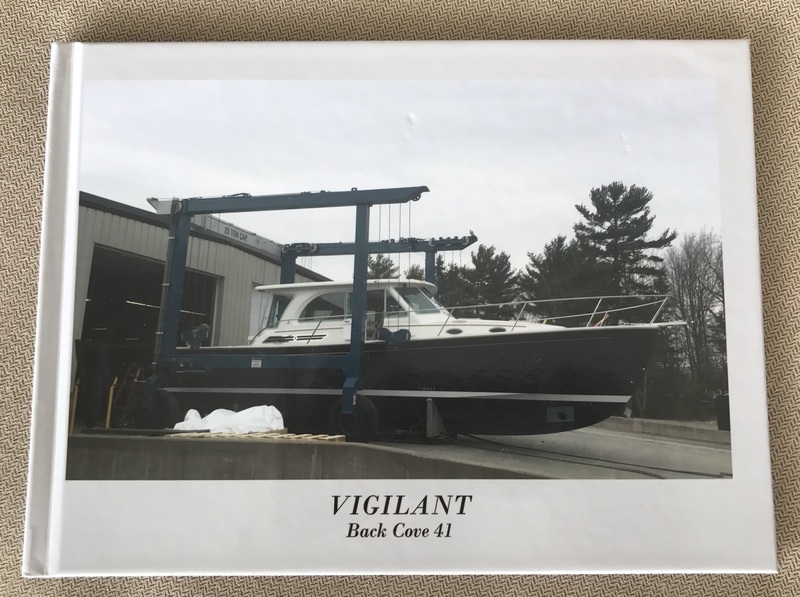 Vigilant left the Back Cove yard in January or 2017 – 5 months later – quality also takes time. As you may have noticed on my Boatology Page, I’ve ridden boats of all sizes and types on Buzzards Bay and I can tell you that Back Coves are extremely well suited for the waters of New England. The hull, weight, and layout are well suited for our choppy seas. I have driven every Back Cove made (except the new 32) and I can tell you even the 30 does a great job of eating up chop without pounding once you find the right speed. The big single diesel combined with a keel-less hull makes them very economical to run. Mean Kitty weighed about 40% as much as Vigilant and Vigilant gets better fuel consumption at all speeds. Tenacity was even better. The plumbing and electrical systems are incredibly well made and well laid out. Once you know what you’re looking for, you can spot high quality wiring a mile away. Plumbing is a little different. That said, one of the greatest features of Tenacity was the fact that after 2 years, her head never smelled like a head! Although all Back Coves share the classic and beautiful “Maine Lobster Yacht” good looks, they all have very different interior layouts. The 30 and the Downeast 37 are perfect Picnic Boats with the capability for host one couple. The 34 and the classic 37 are true cruisers. And the 32 and 41 are nice balances of both. There are so many different boats one could own, but if you’re interested in cruising Buzzards Bay and beyond, you don’t need to look beyond Back Cove Yachts to find the boat for you. We lien a Back Cove 29 from 2005. This is our third season. We could not agreee more! Great boats!